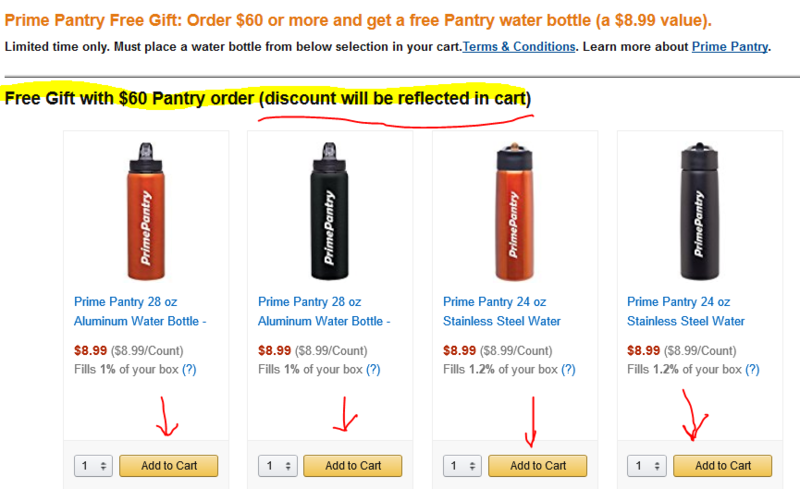 If you are Prime Pantry curious (you haven’t placed an order with them before) AND you are a Prime member, Amazon is trying to tempt you some more to place your first “Prime Pantry Box” order with a coupon! Coupon code PANTRY10 gets you 10% off if your first order has 10 or more items in it. This is a good opportunity to stock up on consumables, be it food or kitchen or bathroom. You can find the promotion details at the coupon’s page. 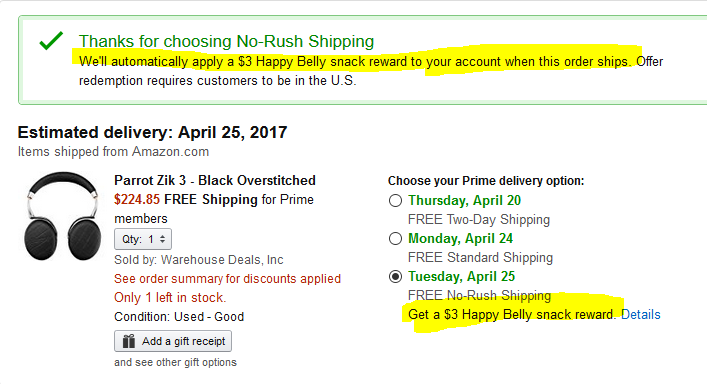 if you select slow-shipping on some regular Prime orders, Amazon may give you a $5 Prime Pantry credit. You can easily check if you have one in your account by visiting amazon.com/norushcredits. That page also shows the expiration date of each credit, so plan ahead! 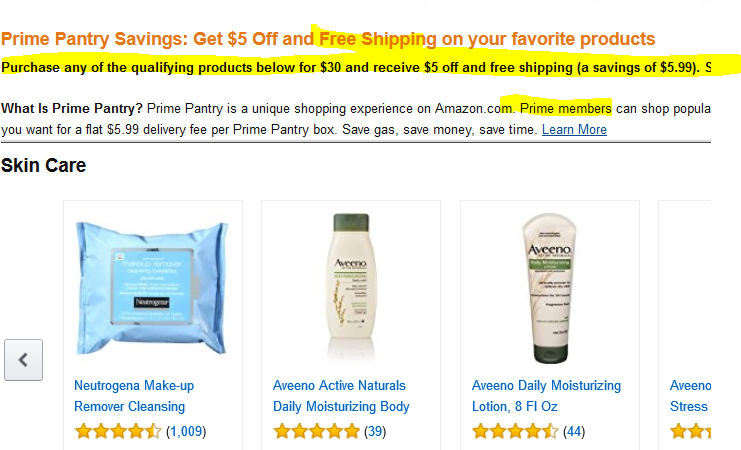 If you are an Amazon Prime member, you have the option to make purchases at Prime Pantry, Amazon’s attempt at a warehouse-club type of a service. 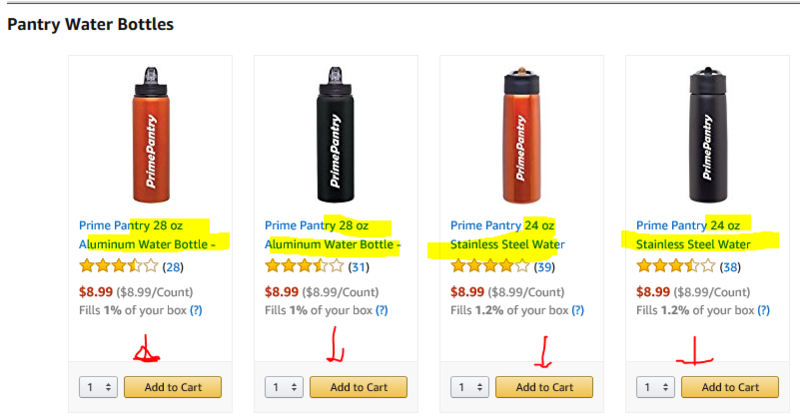 For a limited time, they have a new promotion, if you place a Prime Pantry order of $60+, you get a FREE 24oz Water Bottle. You must add the color of your choice in your shopping cart, together with a qualifying $60+ purchase. There are four colors, three of them are Stainless Steel, one is Aluminum, so you have material choices too. The price of the water bottle will be adjusted by the shopping cart in the last step before you place your order, so you can confirm you are getting this for free. 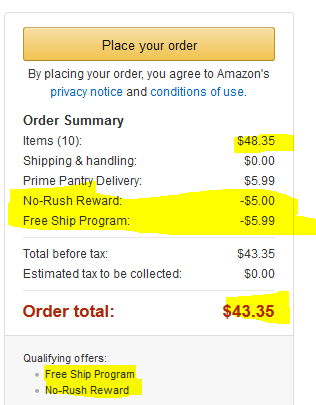 You can stack this offer with any PrimePantry “slow shipping” credits you may have in your account, or you can use it in combination with the Buy Five Free Shipping promotion (you buy any combination of five items from that list, and you get free shipping – it could be five different items, or five units of the same item, or any combination in-between). November is here, and if you like to shop at Prime Pantry but don’t like paying that annoying $6 shipping fee, there is a new round of select items that trigger free shipping for your order. You have to buy at least five of them, but they don’t have to buy five different items. It can be any combination, for example, you can buy five of the same item. They have a variety of categories, making it easier to find something if you are a regular Pantry-shopper, including breakfast items (cereals, protein bars, etc), along with household items (eg toilet paper), health and beauty items, beverages, snacks, and such.